Last spring, biologists from North and South Dakota tagged the last of about 36,000 walleyes that are part of a comprehensive and long-running study on the Missouri River system in the two states. Since 2013, North Dakota Game and Fish biologists have tagged more than 17,000 of those fish from the Missouri River and the upper end of Lake Oahe. The study area extends from Garrison Dam in central North Dakota downstream to Oahe Dam in South Dakota, and it involves a major collaboration of biologists and researchers from the Dakotas and South Dakota State University. “The study is designed to assess walleye movements, mortality and what proportion of the walleye population is harvested annually by anglers,” said Paul Bailey, south central district fisheries biologist for the North Dakota Game and Fish Department. The study targets adult walleyes, each fitted with a metal jaw tag stamped with a unique number to identify the fish and a phone number to report the tag. Anglers can keep or release the fish. Anglers practicing catch-and-release can write the tag number down and report it, leaving the tag on the fish when released. 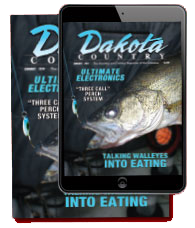 In both states, anglers have caught enough tagged walleyes to provide biologists with some available information. In addition, Bailey says a lot of anglers assume there is a walleye migration that occurs every spring, similar to a spawning run. “The information we are getting suggests that this really isn’t the case,” he said. “What anglers are seeing is really an illusion, based on water temperatures. The spring walleye bite on the Missouri River increases as waters gradually warm upstream and fish become more active, Bailey believes. Movement patterns suggest more than half of the tagged walleyes that were reported by anglers were caught within 10 miles of where they were tagged and released. However, Bailey said the pattern shows fish tagged in North Dakota moved greater distances than those tagged farther downstream, and North Dakota fish moved both upstream and downstream after tagging. “The rule is that these fish aren’t moving very far, but for every rule there are some exceptions,” said Bailey, noting that some fish tagged in the Garrison Dam area were later caught near the Oahe Dam, more than 200 miles away. 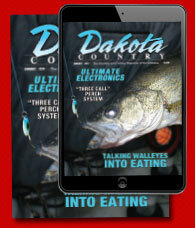 Anglers can call the South Dakota phone number found on the tags to report their catch. They can also go to the North Dakota Game and Fish website, gf.nd.gov, or call (701) 328-6300. Anglers should record the date and location of the catch, whether the fish was kept or released, the tag number, and the length and weight if the fish was measured.